There are many water retention ponds located throughout South Winnipeg, and sometimes, local folks clear them in winter for use as skating rinks. However, this is NOT safe! The City of Winnipeg cautions residents NOT to use retention ponds for skating. 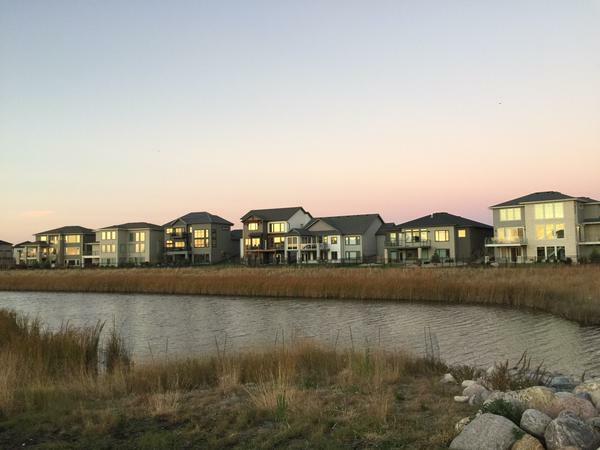 During winter, water from an early snowmelt or nearby watermain breaks drain into retention ponds. This winter runoff is often mixed with street salts that can cause the ice to melt and thin quickly. Runoff is released underneath ice on the ponds, resulting in a thinning of the ice that is not evident from the surface. 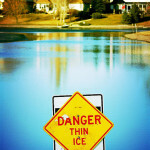 As a result, ice conditions on ponds can change quickly and without warning, creating an extreme hidden hazard. A recent article (see below) further highlights the potential hazards and dangers of using storm-water ponds for skating rinks. The congregation at Southlands Community Church (85 Keslar) has also built a skating rink open to the public, and I am pleased to have coordinated the acquisition and delivery of a warming hut for this rink! Stay active and enjoy our winter safely! EDMONTON – Mark Loewen and his research team spent the last two winters hauling around a radar machine and drilling through ice as children and adults raced around on skates and fired slapshots. The Edmonton scientists now are crunching data in what Loewen, a University of Alberta civil and environmental engineering professor, believes is the first comprehensive study of ice on city storm-water ponds. So far the study has confirmed what most municipalities already know — ice thickness on small suburban lakes is not as certain as ice that forms on natural water bodies. It’s constantly changing as runoff and drainage water flows through the ponds all year. “A lot of time the ice covers can be safe,” said Loewen. “But if they’re safe on a Monday, that doesn’t mean they’re safe on a Friday. Water moving through the ponds can be warmer and turbulent and melt ice faster, said Loewen. Even if water has frozen all the way to the bottom of a shallow section, channels of water can still cut through it. Another contributing factor is road salt, he said. Depending on how much is applied to nearby roads and how much runs off into ponds, it can also speed up thawing. He understands why people want to lace up for these ponds. There are about 160 in Edmonton — most in newer neighbourhoods right outside residents’ back doors. But the ice is too iffy. The City of Edmonton requested the study, Loewen said, since skating on storm-water ponds is somewhat of a touchy issue. Signs posted at city ponds warn against skating on them, but many people do it anyway. Just two weeks ago, park rangers fined a man $100 after he shovelled off and flooded a section of a pond behind his family’s home. Because there’s no specific bylaw against skating on the ponds, the ticket was for modifying land in a way that could cause injury. Oil-refinery worker Brian Tomlinson said his family has skated on the storm-water pond in the past without trouble. When he told his kids that it was off limits this year, his three-year-old daughter burst into tears. Tomlinson, who says there’s nothing more Canadian that playing pond hockey, plans to fight the ticket in court next month. It’s the first fine related to a storm-pond rink that the city has issued in the last few years, said Greg Komarniski, a city park ranger. The pond behind Tomlinson’s home is a bit different than others, he said. Called Poplar Lake, the pond is fenced off and marked with a sign warning of thin ice. It’s also an environmentally sensitive area. In this case, Komarniski said, rangers responded to a complaint and decided to give Tomlinson a ticket rather than a warning. Wendy Laskosky with the city’s drainage department said warning letters are sometimes sent to residents in neighbourhoods where staff find rinks on storm-water ponds. As the city grows and more ponds are built, skating on them will become more of a concern, she suggested.